Following on from the previous generation, which won the European Car of the Year in 2009, the Insignia Sports Tourer is based on a completely new vehicle architecture. Its revised proportions result in more luggage capacity that has increased to 1,640 litres, over 100 litres, more than the outgoing model. The length of the boot has grown by 97mm to 2005mm versus the previous model and 40/20/40 foldable seats are available, making it even more practical. Like with the Astra and the forthcoming Insignia Grand Sport, efficiency was key for engineers. The new model is up to 200 kilograms lighter than its predecessor, thanks to the use of lightweight materials and efficient packaging. This weight loss allows for high-tech features such as the ultra-modern all-wheel-drive system with torque vectoring and the new eight-speed automatic transmission to exploit their strengths to the full. There is a raft of top technologies that make driving the Insignia Sports Tourer safer, more relaxing and more comfortable than before. Next generation IntelliLux LED matrix lighting, Lane Keep Assist, Head-up Display and unique AGR-certified premium seats, front- and rear-seat heating and a heated windscreen are just some examples. Outstanding infotainment and connectivity are also on board thanks to the latest generation IntelliLink systems and Vauxhall OnStar, which with the launch of the Insignia Sports Tourer, will offer even more functionality for customers. Although the exterior dimensions have grown slightly to 4,986 millimetres, the Insignia Sports Tourer looks much more athletic and agile. The prominent front grille and Monza Concept-inspired headlights all add to this perception. The model’s stance is also emphasised by the extended wheelbase, now 2,829 millimetres, and a front overhang that has been reduced by 30 millimetres. The silver roof rails make it look lower, and emphasise the high-quality design. 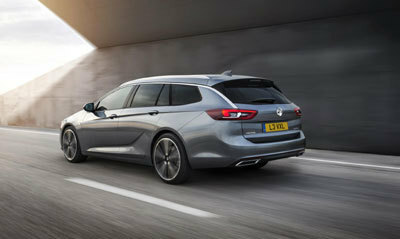 The next generation Insignia Sports Tourer is more practical than before; the overhang between bumper and boot has been reduced, thanks to the neatly designed rear end, making loading easier. Thanks to the increased width between the wheel arches it is now easier to pack bulky items. The luggage capacity has increased further too, reaching 1,638 litres when the rear seats are folded down – over 100 litres more than the outgoing model. To make loading as easy as possible, the tailgate can be opened with a kick, without the need to touch the car. In combination with Keyless Entry, a simple small kicking motion under the rear bumper is enough to open or close the tailgate. To further increase loading space, the new Insignia Sports Tourer comes with optional 40/20/40 foldable rear seats, enabling more flexible luggage space configurations. The rear seats can be folded down simply at the push of a button, conveniently located in the luggage compartment. Passengers now experience more comfort than in the outgoing model, with more space than before; headroom has increased by 31mm, shoulder-room by 25mm and space for the hips by 27mm. Additional luxury is provided by the optional panoramic sunroof stretching back over the heads of rear-seat passengers to give a greater feeling of space and increased levels of natural light. The new model contains heating systems that ensure the comfort of all occupants. Reducing the need to spend time de-icing the car in cold weather, the windscreen can be easily defrosted at the push of a button by a fine wire heating element. The heated windscreen also prevents fogging in humid conditions, improving visibility and safety. The heating switches off automatically and can be reactivated if necessary at the push of a button. Drivers can stay snug thanks to the heated steering wheel, while heated seats are available not only for the driver and front passenger, but for the occupants of the outer rear seats too. The heating in the front is adjustable and can be controlled through the personalisation menu in the information display, while the optional 18-way adjustable heated driver’s seat also features massage and ventilation functions. The driver of the new Insignia Sports Tourer sits lower in the car and is surrounded by the ergonomically-designed instruments and centre console. As well as via a touchscreen, the controls can be operated by three rows of buttons. The top row is reserved for the infotainment system, the middle for controlling the heating, ventilation and air conditioning and the bottom for driver assistance systems. Smartphones can be seamlessly integrated into the vehicle’s infotainment software, with the latest Apple CarPlay and Android Auto compatible IntelliLink systems, and wireless phone charging now available. Vauxhall’s ground-breaking connectivity and service assistant, OnStar, is also on board, offering services ranging from Automatic Crash Response to Stolen Vehicle Assistance. A new Personal Assistant service will be launched with the Insignia, enabling the driver or passengers to ask OnStar advisors, to book a hotel in the car when it is safe to do so. OnStar also provides a Wi-Fi hotspot for up to seven devices to keep all occupants connected while on the go. One of the highlights is the next generation of Vauxhall’s innovative and award-winning IntelliLux LED matrix light. It now has 32 LED segments – twice as many as in the Astra – that are all integrated in the new slimmer headlamps of the Insignia. The increased number of LED elements enables the various light patterns to adapt to the prevailing traffic situation even more precisely and the transitions between the modes are more seamless. This results in an improvement of both the quality of light distribution and light intensity. To improve visibility even further while driving through curves on full high beam, the engineers added a new function to the new Insignia’s IntelliLux LED matrix headlights. The light intensity at the inner matrix segments rises according to steering angle in order to increase the illumination of the curve. In addition, a further high-beam spotlight provides additional illumination at full high-beam for up to 400m. The new model is the first Vauxhall to feature an active bonnet. In the case of a collision, the bonnet lifts in milliseconds, increasing the distance to the engine and offering pedestrians improved protection. Driving pleasure and safety in every driving condition are guaranteed thanks to the Insignia Sports Tourer’s new intelligent all-wheel drive system with torque vectoring. Two electrically controlled multi-plate clutches in the all-wheel drive system replace the usual rear axle differential, providing a more precise power transmission to each wheel individually. When cornering, additional torque is transmitted to the outside rear wheel, reducing understeer and enabling more precise control. The system reacts within a split-second of the accelerator being pressed, ensuring that the car remains more stable and easier to steer in every situation. The FlexRide chassis has also been further improved, adapting the dampers, steering, throttle response and shift points (on automatics) independently or based on the modes ‘Standard’, ‘Sport’ or ‘Tour’, which can be selected by the driver. 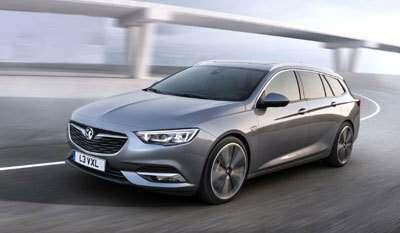 The Insignia Sports Tourer will be available with a range of turbocharged petrol and diesel engines along with latest generation transmissions, including the new eight-speed automatic gearbox, a first for the Vauxhall passenger car range.